A high cobalt m42 HSS cutting edge electron beam welded to a tough yet fiexible alloy steel backing giving the blade and extremely hard cutting edge , while having a fully fiexible back . 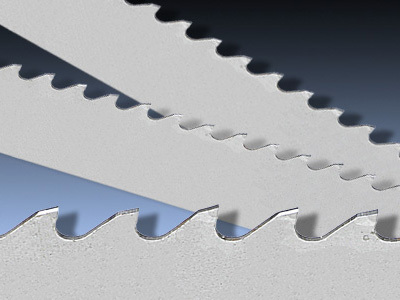 The M42 Bimetal band saw blade should be used for cutting solid sections on a production basis , and bimetal band saw blade is particularly impressive on the more difficult to machine materials such as stainless steel , nimonic , titanium and nickel alloys . On horizontal Band Saw machines the width of the band is always specified by the machine manufacturer and is determined by the width of the bearing surface on the wheels. Slight increases in band width are sometimes permissible but departures from recommended widths are not advisable. It is important that the set portion of the teeth is always clear of the wheels and guide rollers. Recommended for use on all ferrous metals and for genral pirpose cutting. It has a full round smooth gullet. Features a flat gullet which gives larger chip clearance when cutting ferrous and non ¨C ferrous metals, woods and plastics. Used at high speeds. 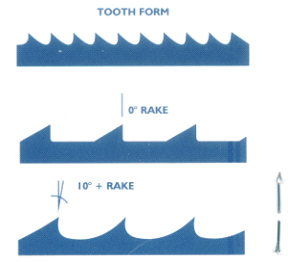 This tooth for has a lengthened gullet and the tooth face has a positive rake of 10o It is most suitable for non-ferrous metals. The following sizes are available : 13mm, 20mm, 27mm, 34mm, 41mm, 54mm and 67mm.